Click on the view slideshow link below to view a few photos from a celebratory lunch/coffee hour in honor Fr. Dennis' 65th birthday. 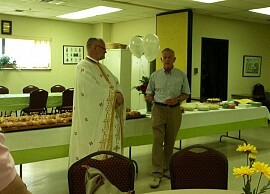 It was held in the Church Hall after Divine Liturgy on Sunday, June 16th. Click on the view slideshow link below to view two photos showing Cantor Van Michael being recognized for his years of dedication and service to St. George. 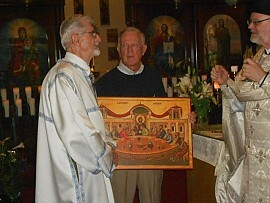 An Icon of the Last Supper was donated to St. George in Van's honor on the occassion of his 80th birthday. Click on the view slideshow link below to view a few photos from the Paschal Vespers service and a few photos of parishioners and children at the Children's Easter Egg Hunt held on the parish grounds. Click on the view slideshow link below to view some photos from the Pascha Divine Liturgy service at midnight.